Card Text Play: Deal 1 to each creature. Deal an additional 3 to each creature if your opponent forged a key on their previous turn. 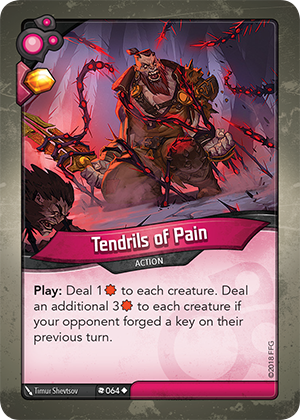 Does Tendrils of Pain deal damage simultaneoulsy to all creatures affected? Yes. If multiple creatures are damaged by a single effect, that damage is dealt simultaneously. Therefore, all damage dealt from Tendrils of Pain is dealt simultaneously.